I don’t know about you, but I can come up with lots of excuses for not working out. Most of the time, it’s due to being bored with my routine. Other times, it’s because I’m tired, not in the mood, or it’s too hot. When those feelings of sabotage arise, I break out my favorite workout motivation essentials to help get me moving again. My first essential for keeping up the motivation is a killer playlist. Back in my college days, my friends and I would create mixes designed to get us through a workout. Though I miss the days of mixtapes and walkmans, I’m happy to have the option of creating as many playlists as I want on my phone. One of my go to playlists actually comes from one artist, Girl Talk, also known as Gregg Michael Gillis. I can’t recommend this artist enough. I have listened to Girl Talk’s Night Ripper and Feed the Animals over and over. Why? Because they are basically professionally designed mixtapes spun together to get your heart pounding and your body moving. When I’m not working out at the gym or outside, I turn to workout DVDs, Beachbody on Demand, or fitness channels on YouTube. Varying my workouts tends to prevent boredom and keep me more motivated. Lately, I’ve been really into a Pilates challenge I discovered from Boho Beautiful. I’m also a huge fan of Yoga with Adrienne, Fitness Blender, and Blogilates. Each has a unique style and offers me different types of workouts to suit my moods. Of course, once I get to sweating, I need maximum hydration. I never start off a workout without having a fully loaded bottle of water. Although I have several in my collection, my go to is either my giant, 32 oz., BPA-free Whole Foods water bottle, or my Swell Bottle. 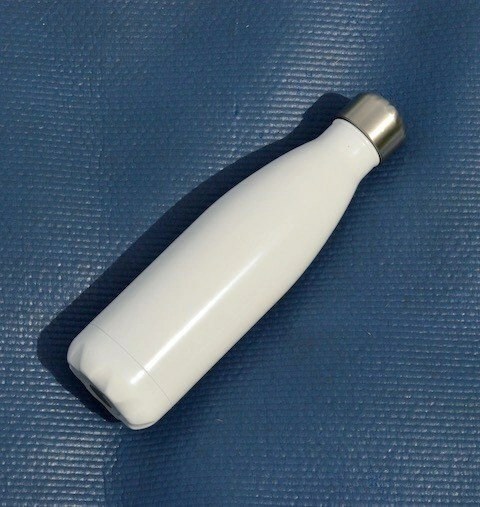 I love my Swell Bottles because they keep water cold for over 24 hours. I never have to worry about adding more ice because I know my water will always be very cold. Finally, and probably most importantly, is my workout gear. Nothing increases my workout motivation more than activewear that is comfortable, high performing, and fashionable. My latest find comes from Just Live, who was kind enough to send me two pieces from their new collection to try. I choose the Race Time Cropskin Blue Fish and the Expression Muscle Tank – Buddha Blue from their Summer Lookbook. I just couldn’t resist having my very own Buddha shirt, or workout capris that reminded me of the ocean. 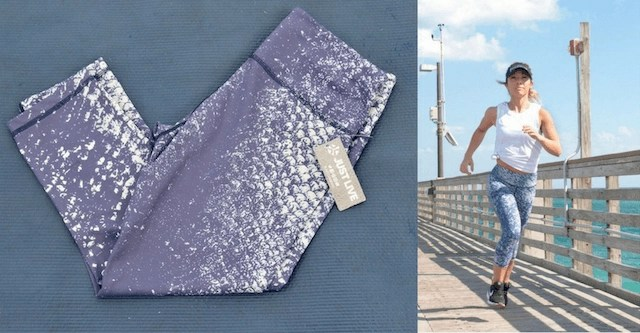 What I love most about the Race Time Cropskin Pants is their proprietary Yolon Fabric. It’s designed to remain cool to the touch and feel like a second skin. It’s lightweight, yet helps smooth and sculpt all my curves. Plus, it wicks moisture away so I don’t get overheated or overly sweaty. I’m also a huge fan of the stitching, which is designed for maximum comfort and longevity. The Expression Muscle Tank in Buddha Blue isn’t just cute, it’s well made. I love the soft Viscose/Spandex blend, which helps this super comfy shirt hold its shape. I kind of wish all my workout shirts were made the same way. I can’t wait to see what Just Live comes out with next to help keep my workout game going strong. What’s your workout essentials? What do you do to stay motivated? I have a hard time getting motivated to work out, it’s one of the reasons I joined a massive yoga studio in my area. It has four locations and a TON of class options so I can switch it up when i’m bored. I love those pants! Hope they are as comfy as they look! 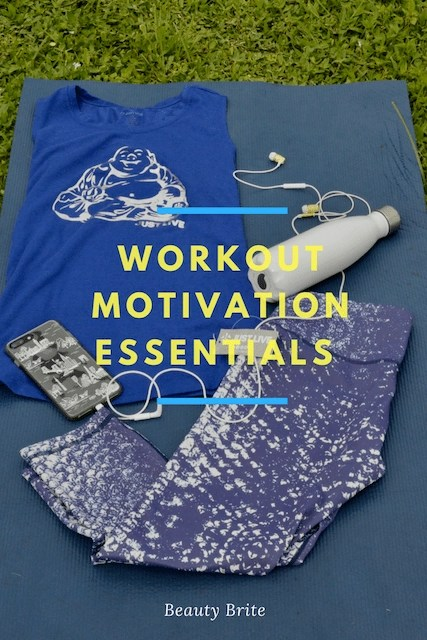 Those are great workout motivation essentials! I really like that tank top. 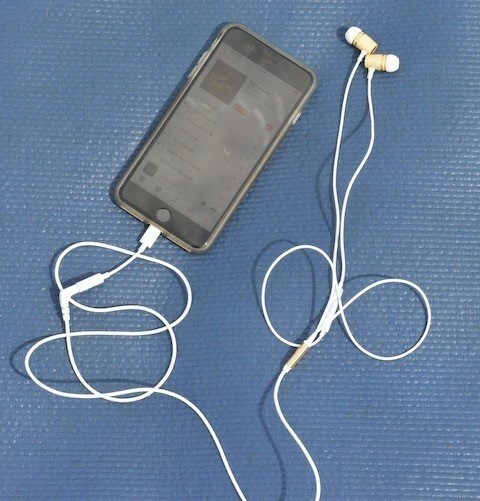 A great pair of earbuds is a total must! It’s such a fun top. I was totally drawn to the buddha. You have got to have a good workout playlist, that is for sure! That keeps me going. Great workout gear which will help with the boredom of the workout. A good water bottle helps but the great tunes will keep you going. I need a lot of motivation to go to the gym. I love all your ideas. I have a really nice water bottle that I save just for workouts. My motivation was down this week — and I need to get back in my groove. I either go to the gym or put on YouTube — thanks for all the suggestions of other kinds of workout videos. I’m pretty curious about Beachbody on Demand. I need all the motivation I can get and a new workout outfit always does the trick!! A water is a runner up for me as well. The right essentials will definitely keep me motivated to stick with an exercise routine. Our family has water bottles we love and don’t leave the house without but they aren’t great for morning runs. Not every product is good for every occasion so it’s a good idea to have your own workout gear aside from what you are normally using. Great, practical list of essentials. I buy new water bottles all the time, but I tend to wear my workout clothes into the dust before I go out and get anything new. Good workout clothes definitely help! I just love that I don’t have to sacrifice style for comfort and have both while I exercise. Loving those pants! A good playlist, full water bottle & nice workout gear – I love these outfits on you! I want to get back into running so might treat myself to some new gear to motivate me! I believe having great workout stuff will help us become more eager in what we’re doing. You got the best list – everything we need and want. Especially music!